Look at the two food bank vouchers above. The one on the left was introduced after 2011 when the trust and Department for Work and Pensions (DWP) and the Trussell Trustagreed that Jobcentres should be allowed to refer customers to trust food banks. You will note there are three slender boxes in the top third of the form which enable the referrer to indicate why they referred the person: because of benefit delay, benefit change, or refusal of crisis loan. 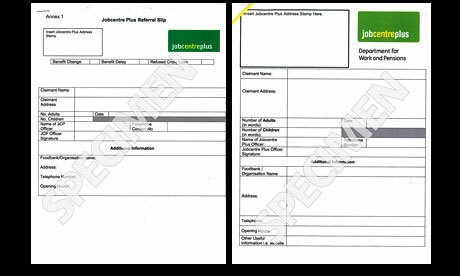 Now look at the new voucher, on the right, which was unilaterally introduced by Job Centres in April, following the introduction of a series of welfare reforms. You will see that the boxes which identify the reason for the referral taking place have been removed. The vouchers no longer tell the trust why the person has been referred. This change – one might even call it a tampering, because it went ahead without consultation or agreement, according to Trussell Trust – is a small but telling detail. It has the effect of removing data that helps highlight why impoverishment caused by welfare reform has become one of the biggest single drivers of people turning to food banks. Removing the boxes doesn’t mean we won’t know this is what is happening – talk to any food bank volunteer, and they will tell you that bedroom tax, sanctions and benefit delays and the like are having a huge impact on food bank use – it just makes it harder to demonstrate the link in hard statistical terms. It smudges and distorts the reality. It is a petty, cynical obfuscation (jobcentres account for just 2% of all Trussell Trust referrals) but perhaps not surprising: we should not underestimate the absurd amount of political capital work and pensions minister Lord Freud has wrapped up in his ridiculous claim that there is no link between welfare reform and food bank use. This move, it seems, is all about protecting Lord Freud. The Trussell trust (using the original forms as a data source) has been effectively demolishing the Freud position for some time. Its figures, published in July, showed more than half of the 150,000 people receiving emergency food aid from Trussell food banks between April and June were referred because they had been made penniless by benefit delays, sanctions, and financial difficulties relating to the bedroom tax and abolition of council tax relief. Nearly one in five (19%) of all referrals to Trussell food banks in the three months to June related to benefit changes – up from 12% during the same period in 2012, the trust said. Benefit delays accounted for 33% of referrals, up from 31%. The new form will make it harder – but happily not impossible – to provide that kind of precise analysis. Trust executive chair Chris Mould accuses the DWP of having “privately reneged” on the agreement by making the change. It is baffling, he says, that the prime minister David Cameron praised his government’s decision to allow Job centres to refer people to food banks at PMQs this week, when at the same time “some people within DWP are doing their best to block the agreement”. Some Jobcentres are not referring people to food banks at all, others are sending people to food banks without a food bank voucher and DWP have recently dropped the rule that Jobcentres must record the reason why a person needs the food bank. This means that people are being sent by Jobcentres to food banks without an indication of the reason for the crisis so that The Trussell Trust cannot be sure that the need is genuine or keep track of the different reasons why people need emergency food. I read that statement again and again and it still doesn’t make sense. If it were interested in shedding light on why the state refers people to food banks it would update and expand the boxes on the form – not remove them all. DWP no longer offers crisis loans – true. But if DWP were interested in helping its penniless customers it would alert them to the existence of its short-term benefit advances instead of pretending they don’t exist. But the DWP, capriciously, wants it both ways. It needs political cover for Freud so likes to pretend food banks have nothing to do with austerity and welfare reform; but it sends its impoverished customers in droves to them anyway. This article I wrote in July, based on a visit to the Pecan food bank in south London, gives you a flavour of how the DWP is now directly and indirectly almost pathetically reliant on food banks. Indeed, one (non-Trussell Trust) food bank, which refused to take Jobcentre referrals on principle, told me the DWP gave out photocopied maps to desperate claimants and tried to refer them to it anyway. For now, Trussell trust is honouring the new Jobcentre vouchers – and collecting detailed data on why the referred person has been sent to them, so that the links between welfare reform and food bank use are not glossed over. It says no genuinely referred person will be turned away. But it is concerned that the DWP (which took a year to agree to issue vouchers in the first place) has acted in such bad faith, and has so far refused to meet to discuss matters. Food banks ought to be celebrated by the Coalition as a manifestation of the Big Society but it remains deeply embarrassed by them. Governments don’t really like food banks – particularly those such as Trussell Trust, which count the food vouchers in and the food parcels out; they shine an unforgiving light on modern poverty, and they reveal the dirty secrets of austerity and welfare reform. This entry was posted in Uncategorized and tagged Big Society, Coalition, food bank, Trussell trust, welfare reform. Bookmark the permalink. That’s right JC. In fact, there are stories circulating of people returning food items that require cooking and swapping them with those that don’t such as cereal. I still say that benefit sanctions are illegal as they leave the person with no money to as you say buy food etc which is not compatible with life and is therefore a breach of Article 2 of the Human Rights Act. Agreed and unfortunately the people affected are highly unlikely to be able to pay for the means with which to enforce their Human Rights. However, I believe that a full investigation and benefit sanctions is warranted in cases where the people using the food parcel scheme are found to be paying a subscription to Sky… from recent experience I know for a fact this happens.